"Consciously or unconsciously, [the child] increases his experience every time he opens a book. The accretion may result in daydreams and the acquisition of a set of false standards, or it may have authentic value. Autobiography gives us plenty of evidence of both results. Since this is true, the book which gives the child experience outside of his personal limits should be carefully scrutinized in the making and in the using." 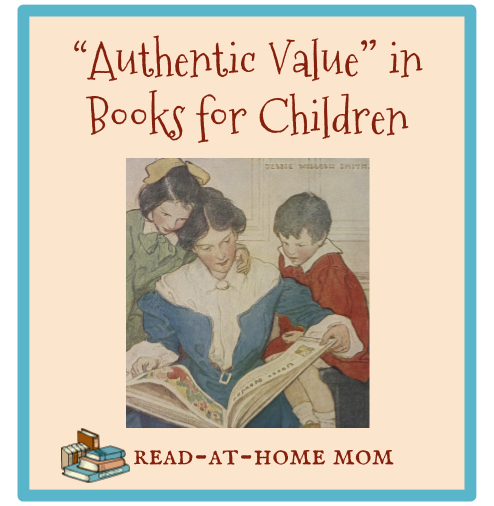 As my husband and I build the library of books our children will read as they grow up, I think a lot about the question of "authentic value." There is a common belief in the larger children's literature community (including librarians, bloggers, publishers, teachers, etc.) that the only truly important indicator of the quality of a book is whether a child wants to read it. The key to raising eager readers, this argument holds, is to let them read whatever they want without judgment from adults. In the seventh edition of his popular The Read-Aloud Handbook, Jim Trelease writes, "Allow children to choose the books they wish to read to themselves, even if they don’t meet your high standards." Let them select their own books, praise whatever they choose, and voila! they will love to read. What is forgotten when we enter this mindset, however, is the notion that books have a very strong influence in the life of a child, not just when it comes to entertainment or education, but also in terms of values, standards, and morals. Children - especially young ones, like mine - internalize everything they read, making stories a part of their play, their lexicon, and their understanding of how life works. The more limited a child's experience, the more powerfully a single book can impact his understanding of the world, for better or for worse. If the books given to young children contradict the family's values, or reject natural law, or employ crude humor, children simply accept these as representations of the larger world, without their parents necessarily even realizing they have done it. Therefore, I absolutely believe, as Robinson does, that all the books I share with my children ought to be evaluated carefully, and that the books which are read aloud to them, and the books which they read independently should always be held to a high standard. As Leila Marie Lawler pointed out in her recent blog post at Like Mother, Like Daughter ("Thoughts on getting the reluctant child to read, with 7 practical suggestions"), "When it comes to what our children read, everything needs to be excellent." When I evaluate books to decide whether to purchase them - or even to borrow them - for my kids, I find that I focus on excellence in two key areas: values and aesthetics. When it comes to values, I seek books that have a point of view which is consistent with our family's culture. In our case, that means avoiding books which promote moral relativism, political activism, media franchises, and other agendas that are either inappropriate for children altogether or at odds with what we believe. We do occasionally put away books for the future that are less black and white in the values they espouse, but for early childhood, we focus on establishing our identity as a family and understanding how we, as the Fitzgeralds, look at the world. In terms of aesthetics, I think about the depth and beauty of a book's text and illustrations. I look for beautiful language, written in a style that is unique to the talents of the specific author, instead of a more generic, commercial, narrative voice. I want the books my kids hear to be pleasant to read multiple times, and to reward them with opportunities for new insights and observations upon multiple re-readings. I also pay a lot of attention to a book's format and to the care that is put into its appearance. Illustrations which are merely functional, or serve to decorate without enriching the text are not as desirable as those pictures which work together with the text, and which give the child reader a reason to pore over each page. Even beyond these two areas, however, a children's book with "authentic value" will ultimately be a solid stepping stone on the way toward a larger goal of being able to appreciate the works of great literature handed down to us by generations past. Childhood reading is important, not just for motivating kids to want to read, but also because there is only a very short window of time during which the foundation can be laid for appreciating books and the worlds and experiences they contain.